Topics: Emergency Calls, Blockages, Hp Jetting, Plumbing, and Bathrooms. Its 3 nameservers are ns6.be-dns.net, ns4.be-dns.net, and ns5.be-dns.net. Man1 Network C5 England is the location of the Apache/2 server. 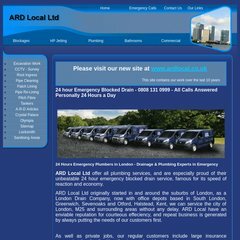 A-r-d.co.uk's IP address is 217.168.156.13. PING (217.168.156.13) 56(84) bytes of data.